But can it really be 'the Google' of online radio? Pure has revamped its online internet radio service, with The Pure Lounge receiving a major makeover and a new digital music store set to appeal and internet radio users. Pure's Lounge will now connect to 7Digital's music store allowing listeners to buy tracks that they are listening to via their internet radio. As is to be expected with any self-respecting new digital music service, Facebook and Twitter integration is there, to let users share info on tracks that they like and new tunes that they are buying. The new platform looks a lot fresher than the original, and there are also now social network options - Facebook and Twitter connectivity is now on board - and there will also be editorial content from the Pure team, including track and station recommendations. Pure's Lounge 2.0, according to the company's news release just in, "now makes it even easier for users to discover new radio and music content via innovative new search facilities and the latest web technology, while the store allows users to buy tracks and manage playlists. All content can be easily listened to and also managed through Pure's internet-connected radio range." The Google of online radio? Colin Crawford, Pure's director of marketing, explains further about the latest additions to its online radio portal: "This totally transformed version of the Lounge offers users the easiest, quickest and most powerful way of finding the audio content that they want as well as discovering new content and accessing ground-breaking services like FlowSongs and the new music store. 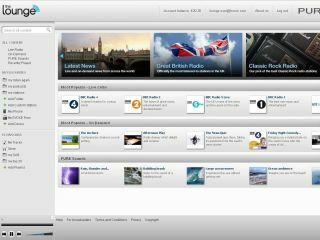 "With this make-over, the Lounge will quickly become the portal of choice for internet media hunters – effectively it is becoming the 'Google' of internet radio portals." Pure hopes that its new search tech will make it easier and quicker to locate content via the Lounge, "which contains almost 200,000 different pieces of audio content including thousands of internet radio stations and the widest available selection of on-demand audio." Whether or not it can realistically be described as 'the Google' of internet radio portals remains to be seen.